In 2017, the Common Reporting Standard (CRS) was established in order to enhance cooperation between governments internationally. As of December 2018, 103 countries have either implemented or agreed to implement the standard. The Information exchanged includes the individual’s name, Tax Identification Number (TIN), date and place of birth, bank details, account balance and yearly income including capital gains. Under the CRS, participating governments are required to comply with international standards for automatic information exchange, developed by the Organization for Economic Co-operation and Development (OECD) allowing governments to designate accounts as reportable under relevant jurisdictions if any improperly declared income or inaccurate filings are noted. Furthermore, the OECD regularly evaluates and designates risk level assessments for tax laws and investment facilities in CRS countries according to their potential for avoiding disclosure requirements. There are 2 important points from their recent publications towards which we would like to draw your attention. 1. In August 2018, the OECD published their “Model Disclosure Rules for CRS Avoidance and Opaque Offshore Structures”. Rule 1.1(e)(ii) commentary point 17 states that the tax residency status issued by certain offshore jurisdictions should be paid extra attention, given that their tax rates are extremely low or exempted and residency only requires minimal periods of stay. 2. In October 2018, OECD published an article regarding 21 countries that offer resident visas or citizenship through investment or fee payment schemes. OECD suggested that financial institutions should pay extra attention to any individuals that hold citizenship or declare residency in these jurisdictions. The aforementioned 21 jurisdictions are: Antigua & Barbuda, the Bahamas, Bahrain, Barbados, Colombia, Cyprus, Dominica, Grenada, Malaysia, Malta, Mauritius, Monaco, Montserrat, Panama, Qatar, Seychelles, St Kitts & Nevis, St Lucia, the Turks and Caicos Islands, the United Arab Emirates and Vanuatu. Prior to these developments, establishing residency or corporate registration in countries with simple investor immigration schemes, exceptionally lax definitions of residency and taxation as low as 10% was a widespread practice that carried little risk. Under CRS, Financial institutions now have requirements to follow when documents originate from certain jurisdictions. 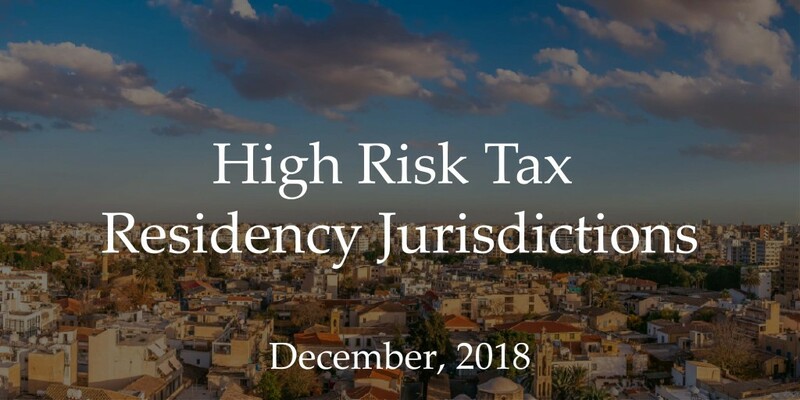 Additional guidance regarding high risk jurisdictions for financial institutions indicates that certification originating from such countries, as well as self-reported income from investor residents, may not be considered reliable or accurate. Such accounts will then be subject to OECD risk analysis and re-evaluation of circumstances surrounding the tax residency arrangements. The list of potentially high-risk jurisdictions is broad and does not necessarily indicate that TINs from these countries are in breach of CRS standards. The majority of the time, investment-based immigration is a legitimate and astute strategy that creates benefits for both individuals and the countries offering such schemes. Important factors to consider include whether you obtained residency or citizenship through an investment scheme, whether you hold residency anywhere else, if you have spent more than 90 days in other jurisdictions during the previous year, and where you have been filing your tax returns. There are numerous details surrounding the individual residence permits issued by any given country, as well as a variety of investment schemes to consider, each with their own benefits and drawbacks under CRS. Don’t hesitate to contact us for a consultation to consider your current arrangements or evaluate future options.